Begin setup of your Linksys Wireless Router by first plugging in the power. Give it 10 seconds or so to initialize and then plug an ethernet cable into your wall jack and into the port on the back of the router marked Internet. Next get another ethernet cable and plug one end into your laptop and the other into one of the ports labeled 1-4 on the router. Your computer is now properly connected to the router to begin its setup and configuration. Next open a web browser window on the connected computer and type http://192.168.1.1 into the address bar and press enter. 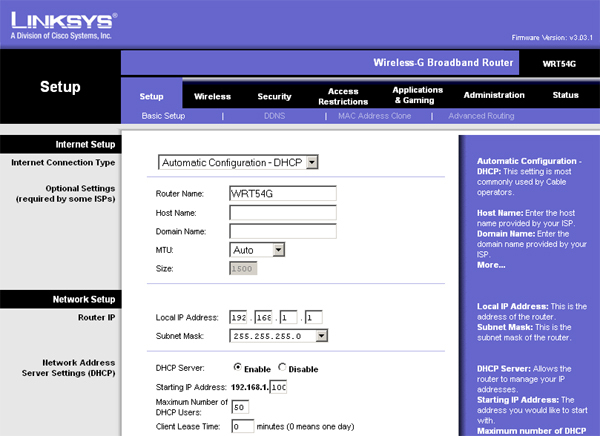 A window will pop up prompting you for a username and password to access the configuration page for your router. Enter admin for both the username and password. You should see the Setup page shown below. On this screen you should change the Router Name from its default value to something unique so that your Base Station will not be confused with another. Scroll to the bottom of the page and click Save Settings then click Continue when the Settings are successful dialog is displayed. Next, click on the Wireless tab at the top of the settings screen. Change the Wireless Network Name (SSID) from the default value to something unique (you can use the same name you set as your Router Name in the previous step. Then Disable the Wireless SSID Broadcast option and click Save Settings and then Continue when the Settings are successful dialog is displayed. Now click on the Wireless Security subsection at the top of the page. In order to password protect your wireless network first use the Security Mode dropdown box to select WEP and then from the WEP Security dropdown box select 128 bits 26 hex digits. Choose a password between 6 and 8 characters and type it into the Passphrase box. Then click Generate. Finally click Save Settings and then Continue when the Settings are successful dialog is displayed. You may also select WPA encryption, however not all network cards support this, so check your documentation first. Next click on the Wireless MAC Filter subsection at the top of the page. Then Enable the Wireless MAC Filter option and select the option to Permit only PCs listed to access the wireless network. Click on the Save Settings button at the bottom of the Filter List window and then Continue. Now click on the Edit MAC Filter List button to pop up a new window (shown below) where you will enter the MAC Address, also known as Physical Address, for each computer that you will be using to connect to your wireless network. If you don't know how to get this information follow the steps here. Once you have finished, click the Save Settings button at the bottom of the Filter List window and then Continue when the Settings are successful dialog is displayed. 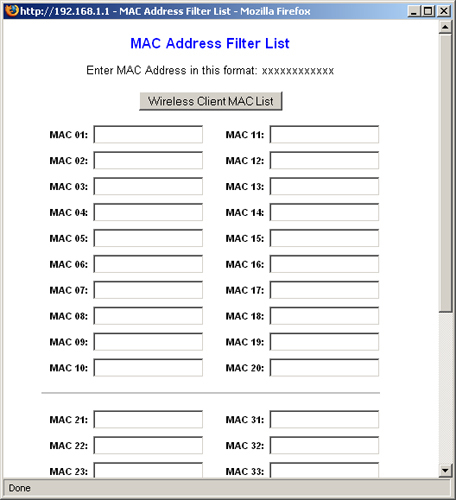 You may now close the Mac Address Filter List window. Creating a MAC Address Filter List will prevent unauthorized computers from using your connection. Finally click on the Administration tab at the top of the page. Change the default password for accessing your wireless router setup pages by typing a new one into the Router Password field and then confirming it. This should be a different password than the one you setup for WEP encryption, but should also be atleast 6 to 8 characters in length. Click the Save Settings button at the bottom of the Filter List window and then Continue when the Settings are successful dialog is displayed. If you encountered any problems during this configuration procedure, please consult the manual that was included with your router or contact the manufacturer.